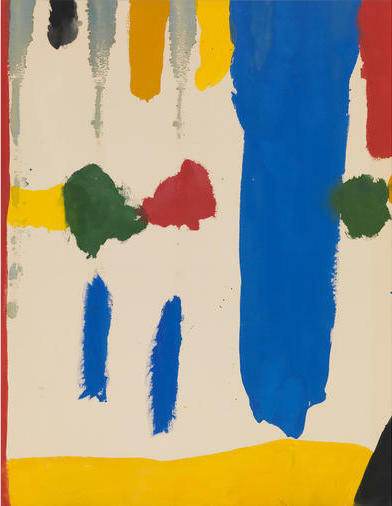 Carolina A. Miranda interviews John Elderfield, curator of Line into Color, Color into Line: Helen Frankenthaler, Paintings, 1962–1987 at Gagosian Gallery, Beverly Hills, on view through October 29, 2016. Elderfield remarks: "The traditional way, of course, is to make a drawing as the basis of a painting, then add color to it. In 'Mountains and Sea,' you can see that’s what she did. There is the drawing, and then the color goes in. But in later works, you see that the color is not shaped by the drawing. It’s shaped by color. And these two things were of interest to her — to make a painting without a preliminary drawing, but to also find ways of setting down color that reads as clearly as the track of a mark in a drawing."